RABBI MICHOEL SHAPIRO, A.K.A. “THE FIGHTING RABBI,” PIVOTS HIS HIP AND launches his shinbone into my thigh, giving me a stinging charley horse. He then whips a left jab toward my nose and crushes my ears with his hands, like a percussionist smashing cymbals together. I can’t hear. My other senses are shell-shocked. But I’m in for more punishment at the hands of the rabbi. He squats down a few inches, and with his hands still cupped over my ears with a vice grip, he jerks my skull downward and smashes my nose on his cranium. Shapiro then jams his thumbs into my eye-sockets. At the same time, my skull is propelled backward. I can’t see. I’m hoping that mercy will be taken on me, but Shapiro has yet to complete his tuchas whooping on me; not until I’m elbowed at the side of my neck, wrapped up in a front bear-hug and kicked to the groin three times. And finally, the coup de grace: Shapiro stomps his foot on the top of my foot and shoves me in the chest, sending my whole body backwards, except for my ankle joint. If this were a real combat situation, my ankle would snap and I’d have a broken, bloody nose and a splitting headache. This is obviously no Torah-study session with the rabbi. Nor is it a bow-to-your-Sinsei, gui-wearing karate class; this is Haganah, an Israeli survival defense method that the rabbi is certified to teach. 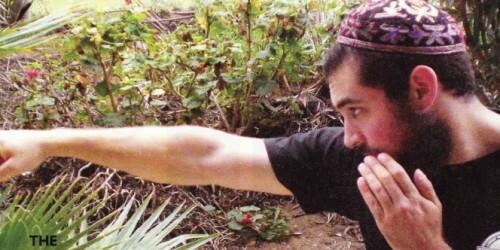 Shapiro, an assistant rabbi at Chabad La Costa, is the only rabbi certified to teach Haganah, which is similar to Krav Maga, only it has a reputation as being more lethal. “Haganah is an evolved form of Krav Maga,” says Shapiro after our mock-sparring session in the Chabad classroom. While the better-known Krav Maga is an Israeli civilian self-defense program, which teaches effective responses to common street attacks, Shapiro says that the Haganah style-named for the freedom fighters (some would say ‘terrorists’) of nascent Israel- is built on Krav Maga’s foundation by integrating modern Israeli military tactics to the mix. As information poured in from Israel ‘s battle zones, changes were made to the Krav Maga system. Haganah, then, can be described as the most modern version of Krav Maga, continuously evolving and updated. Haganah’s master instructor and developer, Mike Lee Kanarek, is a former Israeli special-operations commando and a multi-discipline survival-fighting guru. This past summer, Kanarek certified Shapiro, who is also certified to teach Krav Maga. Kanarek collects social security numbers of all those who want to be certified in Haganah and runs background checks on all applicants; though it’s safe to say he didn’t have to dig deep into Shapiro’s past. Another person who went through the certification process with Shapiro was one U.S. Marine Corps martial arts trainer, sent by his base to incorporate Haganah into the USMC curriculum. “This was a serious group,” says Shapiro. “I was the only one who taught Bar Mitzvah lessons ,” he laughs. Although Haganah is as serious as death and taxes, Shapiro is endearing and easy-going, but unwaveringly pious. Walking clown the steps of my apartment complex one clay to begin a Russian strength training session I was coaching him in, Shapiro froze like a deer in headlights and promptly turned around, retreating back up the steps. “I’m going to have to train inside,” he told me. The problem: A female resident of the complex was catching some rays in a pool-side chaise-lounge chair in her bikini. But the rabbi infectiously laughs at many of these secular-religious quandaries. Consider the recent Matisyahu concert in San Diego. Shapiro doesn’t look like the Chassidic reggae superstar, yet to someone unfamiliar with Chassidic customs and style, Shapiro looks exactly like Matisyahu. It’s the same reason why many Amish probably look alike. Two teenage girls at the concert, demonstrating cognitive dissonance, pestered the rabbi for 10 minutes, refusing to believe that he wasn’t in fact Matisyahu. The girls weren’t joking; they really thought it was him. In addition to being assistant rabbi at Chabad La Costa, Shapiro is also its director of education and programming. He also teaches weekly evening Torah classes, directs the Sunday Hebrew school and tutors Bar Mitzvah students. Stephanie Lewis, who attends services at Chabad La Costa, sends her sons to the Fighting Rabbi to learn self-defense. “It’s been a superb way to engage my sons in physical activity, raise their self-esteem and foster family togetherness, all while including a Jewish element” says Lewis. Shapiro would like to dispel the notion that orthodox Jews are non-athletic and out of shape. Shapiro says there’s a growing awareness in Chassidic and other orthodox communities about health and exercise. Many orthodox neighborhoods now have kosher health food stores and there are even kosher gyms. Being fit is one thing, but studying and mastering Haganah with as much zeal as the Torah is conflicting for a Chassid. The paradox of religious piety and snapping necks is not lost on Shapiro. 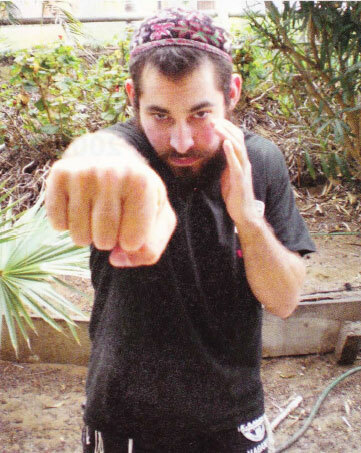 Shapiro has sought guidance from rabbis and teachers about pursuing his passion for martial arts. It’s easy to see why he feels conflicted learning how to fight with a knife and shoot a gun. (He’s been shooting for seven years, ever since a Yeshiva friend took him along to a firing range). “When I feel conflicted, I am reminded that G-d created everything in this world for a higher purpose and I must find that purpose in self defense as well,” says the rabbi. But ultimately, Shapiro thinks Jewish survival and preservation will not depend on whether or not the majority of Jews learn Haganah. ”It will depend on adherence to Torah and mitzvoth!” he claims. Judd Handler, an Encinitas-based fitness trainer, massage therapist and freelance writer can be reached at juddhandler@yahoo.com.